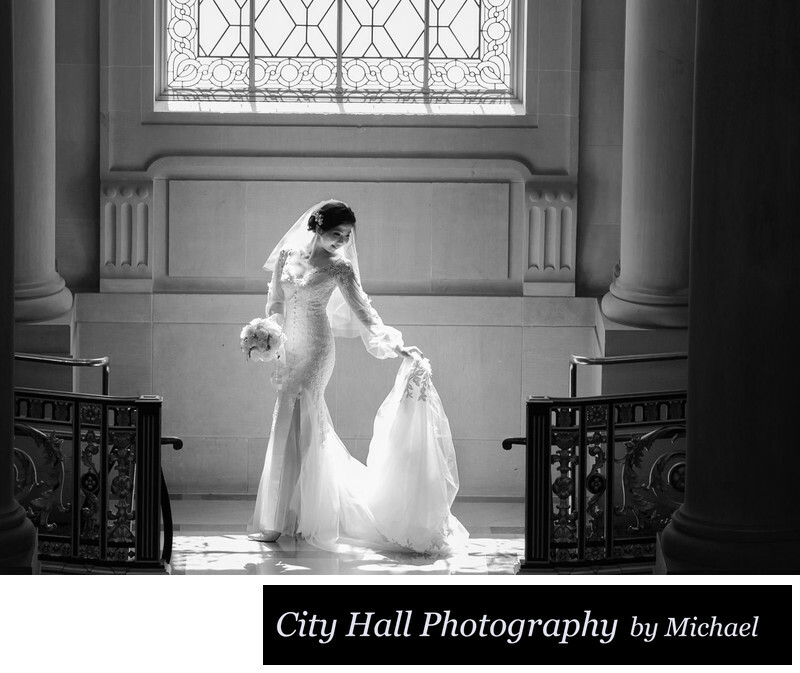 We talk quite a bit throughout this website about our San Francisco tour wedding photography package. Why? Because it's our favorite package and gives us the best opportunity to truly capture the bride and groom in this magnificent city. 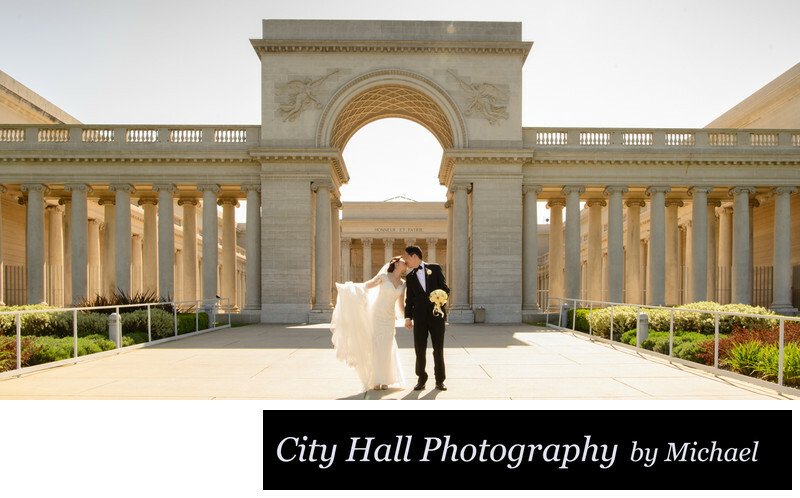 Phoebe and Sean decided to go with this package and we enjoyed taking them around San Francisco, with stops at the Palace of Fine Arts, Lincoln Park Golf Course and the Legion of Honor. We took our time at each location and made sure we captured some great images. The Palace of Fine Arts was a bit windy so we decided to head to the Legion of Honor which is more sheltered. This proved to be a good decision as the weather was completely different at the new location. This type of variability can be pretty typical in San Francisco. If you don't like the weather, drive a little and find something better! Sean and Phoebe joined Toni and I in our car as we toured around the "City by the Bay". We include transportation at no extra charge and feel that the newlyweds receive a higher percentage of actual photographic time because we can just jump out of the car at each stop and start taking wedding pictures. When we try to meet the couple at each destination in separate cars there is always some time taken to find each other and park both cars. Following someone in a car in San Francisco can be quite difficult also! We certainly do not want anyone obtaining a traffic ticket on their wedding date while racing through red lights to make sure they don't lose us. This 4 hour package also gives us the opportunity to get to know our clients in a more relaxed setting. We have had the privilege of meeting people from all over the world and we really enjoy learning about other cultures and traditions. In addition, this exchange of information often results in enhancing the shoot because we learn more about the personalities of our bride and groom. One of the wonderful thinks about San Francisco is that it has culture and history too, so this gives us plenty to talk about while riding in our comfortable Toyota Camry. 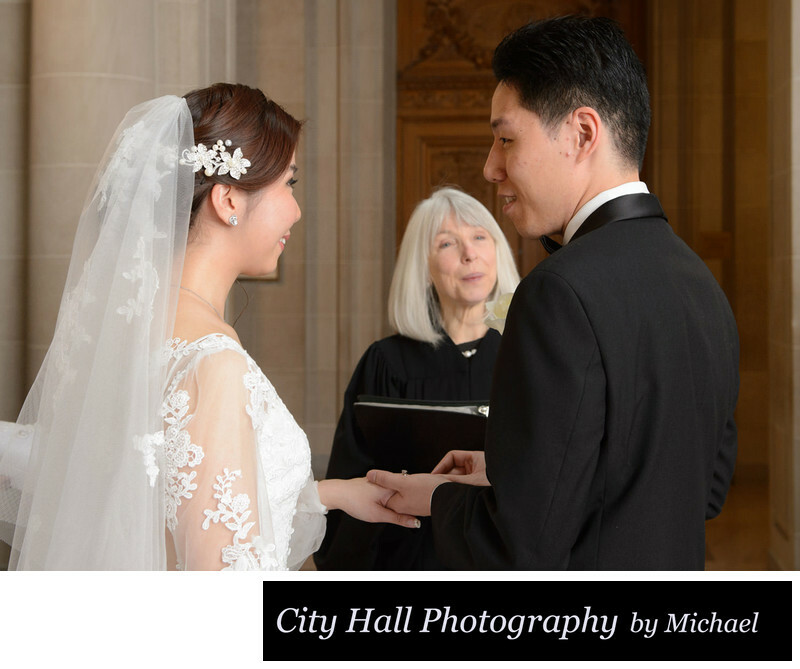 We also try to make it abundantly clear that our goal is not to see how many places we can visit in the 4 hour time period, its more about making it a fun and relaxing day of San Francisco wedding photography. Other great places to visit on this SF tour including Golden Gate Park, Sutro Baths, Lands End, Potrero Hill, and the Haight Ashbury District. 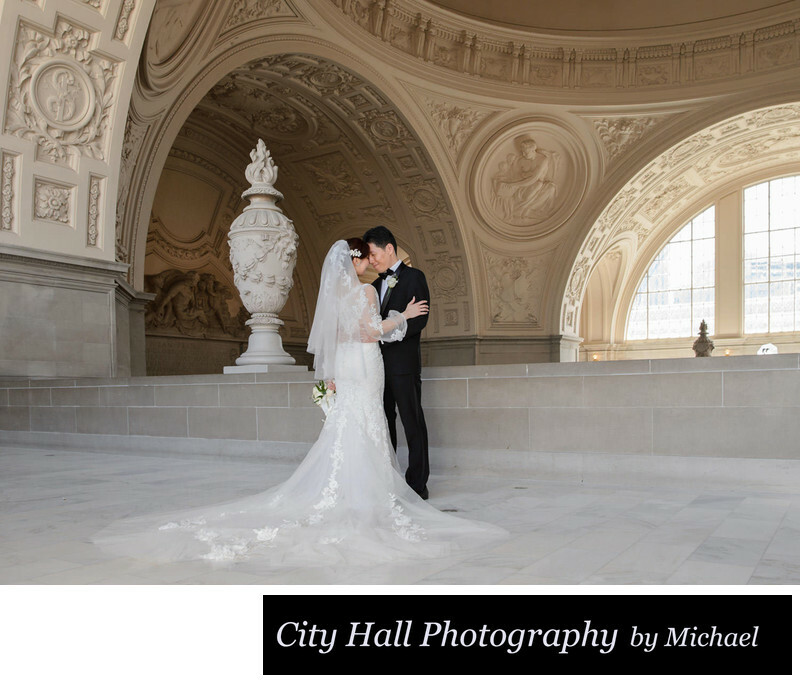 After the ceremony and some family shots, we finished up all the photos at San Francisco City Hall hitting all 4 floors. Then we all piled into my car to head off for a fun tour of the city. 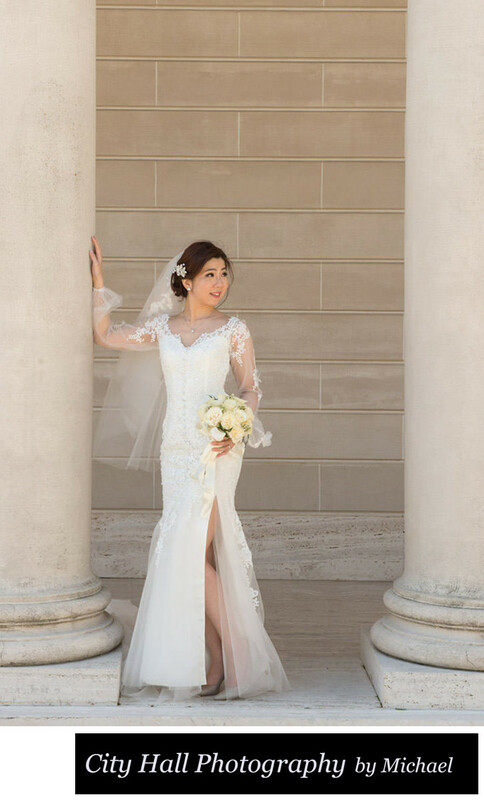 Below are some of the photos we took at the historic and beautiful Legion of Honor. The weather was quite windy throughout the city, but it was calm here. We ended our San Francisco photo tour with a kiss in front of the Legion of Honor. We managed to time it when no tourists were in the way. A fitting end to a great day of wedding photography and fun. 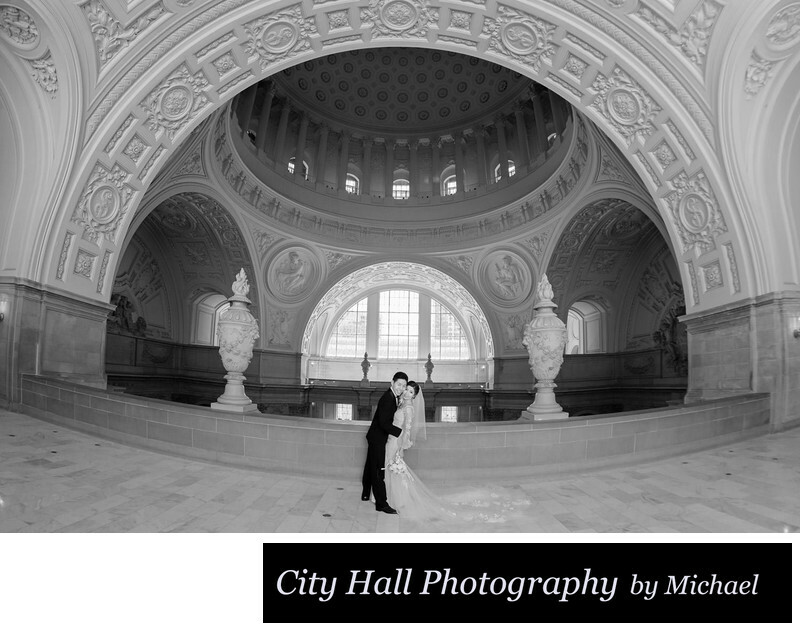 If you want more than just a San Francisco city hall wedding photography session, consider booking this tour.